Book your Home Stay Experience below. All are welcome- choose any day of the week! Groups of two or more adult guests: $60 per person; Children ages 5-15: visit for only $45 per child. Young children under 5: visit for free! Groups of 10 or more are eligible for a group discount. We offer special East Africa Resident rates as well! To learn more, please email us at [email protected]. An overnight Experience is a unique opportunity to participate in the life of a rural artisan and her family. Home Stay hostesses live in homes made of mud brick, which usually have one larger front room for receiving visitors and a few smaller bedrooms for the family. In the enclosed area behind the house, there is an outdoor kitchen, enclosed pit latrine and bathing outhouse, animal stalls and family workspace. Most host families have about four children at home. In Rwandan culture, guests are considered a blessing! Your Home Stay Experience begins with a drive to a nearby village, where you and your Azizi Life interpreter will be welcomed by your rural community hosts. You will meet your host family and see your room, and then it’s off to help with preparations for the evening. You might help out in the kitchen or collect wood for the bonfire. After a bit of an explore around the village, its back home to light the fire and hear some traditional tales. Then you’ll share a simple local meal with your host family, with plenty of time to chat and learn about each other’s lives. After this and the embers of the fire die away, then it’s time to start preparing for bed. As the new day dawns, you will rise and shine and get ready for the day. Then you will share a simple breakfast with your hosts before heading back to the Azizi Life office boutique. Here you will have the chance to think back over the highlights of your night away. You can also browse through some of the beautiful crafts made by the Azizi Life artisans (including your hosts) and do a little fair trade shopping. Who is Coming? Choose your adult guests. Choose the date you would like to visit. Choose the number of adult guests coming. Repeat this process for each age group of guests. Coming with young children? Kids under 5 join in for free! Just let us know in the Notes section of your checkout. We love including toddlers and little ones in the day and even have specialist facilitators. For discounts on groups of more than 9 guests, or if you would simply like a bit more information, please do not hesitate to email us on [email protected] or call us in Rwanda on +250-7858-1146. This Experience starts from Azizi Life’s office & boutique in Muhanga Town (about a one hour drive from Kigali). We would be happy to help arrange transport to Azizi Life Muhanga and so if you need that, just let us know. 15:30 Welcome & Introduction at Azizi Life in Muhanga. 15:55 Arrive in your rural host community. From the main road in the village, you will walk the final 10 minutes to the house where you will be staying. Let us know if you are not able to walk this far, so that alternative arrangements can be made. 16:10 Arrive at the family home of your host, share introductions, do a little home tour, and see your room. 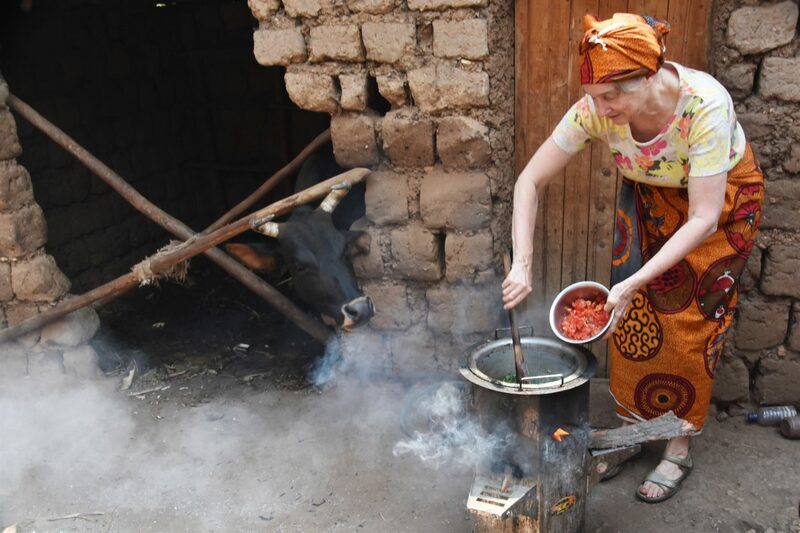 16.25 You may opt to help with evening meal preparation or gather firewood for a little evening bonfire whereby you will sit and hear traditional Rwandan stories. 17:00 A short hike in the village just to explore the village and enjoy the beautiful hills. 18:00 Back to the host family and start the small bonfire. 21:50 Bedtime (This time is flexible, so please feel free to let us know if you’d like an earlier night). 06:30 Wake up and prepare yourself for the day. 08:15 Family goodbyes – unless you schedule a new Experience day after your home stay! 08:30 Arrive back at Azizi Life Muhanga and get a chance to reflect on your Experience. If you would like to take a hot shower when you get back, we are happy to lend you our guest room! Finally, there will be opportunity to peruse all of the beautiful, handcrafted goods on offer from our artisan partners- including your hostesses! This is a wonderful way to gather gifts and souvenirs which you can be confident are fair trade and making an impact. There will be a translator with you the whole time; feel free to ask as many questions as you wish. For daytime attire, men may wear trousers or shorts. Women should wear trousers or a skirt that covers the knees, as Rwandan women usually don’t show their knees. For women, sleepwear should include pajama bottoms which cover at least to the knee. Pack a waterproof jacket during rainy season (February-June & September-November). We recommend that you wear closed-toed shoes: Walking shoes are useful on the paths, which can be steep and slippery. You might want to bring a spare pair of shoes, as one pair may get muddy if you work in the fields. For the evening and morning time, you might be more comfortable with a pair of sandals or flip-flops. If you’re travelling light and would like to borrow a pair, just let us know! Please let us know in advance if you have any food allergies. Food served may contain nuts. Don’t be anxious! Your artisan hosts will do their very best to make you feel welcome. They know that visitors often come from cultures very different from theirs and will be happy to answer your questions about aspects of their daily lives.They won’t laugh if you don’t get the hang of an activity. Or rather, they may well laugh, because they take great pleasure in life, but they will be laughing with you, not at you. You can opt out of any activity at any point, and choose instead to sit and watch. Your bed will be made traditionally out of valley grass covered by a mat, with normal bed sheets, blankets and Rwandan pillows. The bed may be on a bed frame or may be on the floor. Typically, all guests share one room. If you would like a different arrangement, please let us know. A mosquito net will be provided for your bed. We also advise you to bring some insect repellent or spray as it may be needed in the evening. Your overnight hosts don’t have electricity in their home. Like their neighbors, they use oil lanterns or solar lamps. Your host home has a pit latrine, and we will supply you with hand sanitizer and toilet paper. Soap and water will also be available for washing your hands. For bathing, your host family uses water in a bucket or basin to bathe in the bathing outhouse. You of course are welcome to also take a bucket bath. Your hosts may even heat your bath water for you! Although many rural families go without food in the morning, a simple breakfast of black tea with bread and local fruit will be served for you to share with your hosts. You will be supplied by Azizi Life with plenty of bottled drinking water. The dinnertime food is thoroughly cooked: no previous visitors have become ill after eating it. However, if you prefer not to eat, or to eat just a little, you will not offend your host. We will also bring a first aid kit, just in case. Your hosts are a lovely group of women, young and older. They and their families will make you feel welcome, without making a fuss. They know that you are coming to gain an understanding of what rural life is like in Rwanda and will encourage you to join in with their daily routine. Sometimes other members of the community come and stare at white visitors for a while, as white people are seldom seen in rural communities. They are simply curious. Very occasionally, in the community, a neighbor may ask you for money. People often ask each other for money here, and are not offended by a refusal. They are all the more likely to ask a white visitor, as Rwandans often think that white people are fabulously rich. If asked for money, it is best to say no. Your visit is already benefiting the community: the artisan group earns a fair wage for your visit, often saving their payment in a joint account and then spending it on something substantial such as a cow. Their families benefit directly, and so does the wider community. This is because a host will often pay a neighbor to work her fields while she is busy hosting your visit. Additionally, we donate 5% of tourism revenues to our local nonprofit, Azizi Life Impact, for community development work. The women of Abarikumwe are skilled farmers, excellent weavers, and delightful Experiences hostesses. One of Azizi Life’s first artisan partner groups, Abarikumwe has grown together with us, with much laughter along the way. The Abarikumwe artisans specialize in weaving jewelry from natural sisal fibers. We are honored to introduce you to the creators of the very first Azizi Life Experience Day!